"The Hotel opened in 1875. It burned down prior to 1920 and was replaced by the current building. 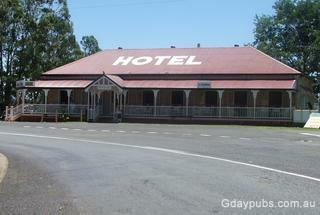 It has a prominent position and people enjoying a drink on the verandah can look right up the main street of the town. This Pub has a great Lunch Menu, everything from Steak Sandwiches to Prawn Cutlets and its a terrific place for Sunday Lunch on the verandah with a cold beer. Great Hosts"